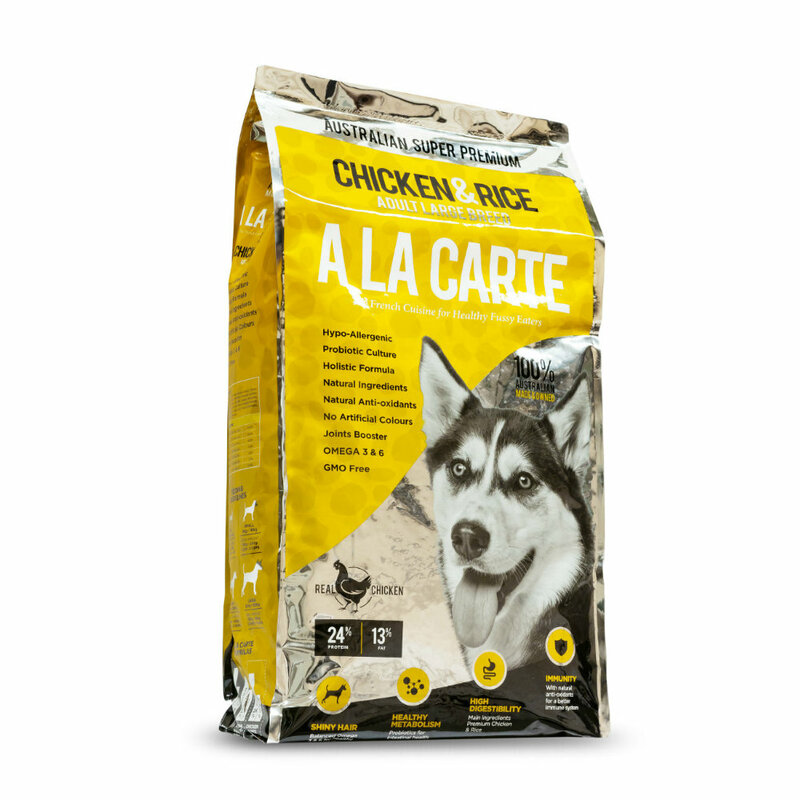 This tasty formula from A La Carte has been developed to meet the nutritional needs of medium to large breed adult dogs and working dogs. A La Carte have ensured there are no nasties (artificial colours and flavours? No way!) so you can feel confident you are feeding your dog the very best. Real chicken, human grade rice, essential fatty acids and vitamins and minerals ensure your dog will be living their healthiest life! By shopping online with Jumbo Pets you can be sure that your details are not compromised – we encrypt every transaction to the highest global standards. This site is secured by Optimum SSL. Copyright © 2005-2019 Jumbo Pets. We've sourced the best products available, from the leading producers and manufacturers, and placed them all in the one spot for your selection. Our dedicated team is passionate about pets and will endeavour to keep you informed of the latest and relevant news and information about your pets. Our stock moves fast! - All our products are fresh and have long expiry dates for shipping. By shopping online with Jumbo Pets you can be sure that your details are not compromised – we encrypt every transaction to the highest global standards. This site is secured by Optimum SSL. Once you've placed your order, our team will handpick your order and arrange delivery of your goods right to your door. This is all backed up by our guarantee. The information provided by the Jumbo Pets website must not be relied upon or regarded as a substitute for specific professional advice, veterinary advice or otherwise. We make no claim that the website is 100% accurate or suitable for an individual's unique circumstance and provide the website on the basis that all persons accessing the website responsibly assess the relevance and accuracy of its content.